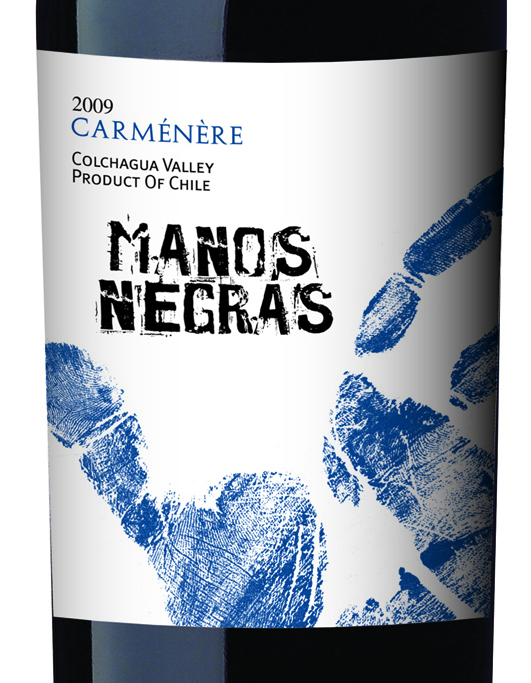 HIGHLY RECOMMENDED: Manos Negras 2009 Carménère, Colchagua, Chile. 14% ABV, $15. Well, folks, this is going to be brief. That’s because I took hardly any tasting notes and haven’t been able to find another bottle locally. This wine is just delicious, but only 1,000 cases were made—if you can find it, grab it while you can. The most gorgeous, translucent garnet color. LABEL: Real winemakers get their hands dirty. Hands black with wine. That’s what Manos Negras is all about. Rolling up our sleeves and getting our hands dirty. That’s how we make these hand crafted wines. Carménère has quickly developed into Chile’s signature red wine grape. It disappeared in European vineyards in the mid-1800s and reappeared in Chile more than 100 years later. Needing a long growing season to reach ripeness, the cool moderate autumns in Colchagua allow Carménère to develop its signature dark, rich fruit flavors and full, yet soft texture. This entry was posted in Carmenere, Chile. Bookmark the permalink.